In a bizarre twist of my so called life where I get everything I want except the ONE thing I want, I found these shoes on Monday afternoon. Except it was Chupa who painted it Pepsi blue! Don't you want one? 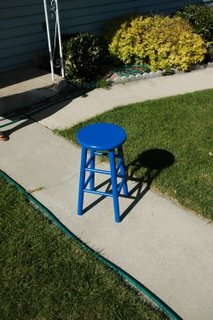 Aren't you jonseing for a Pepsi blue kitchen bar stool? So really, like anyone wants to read my whole account of my day in SLC (2002 Spirit Within) but I have to tell you that we went to this movie called Sophie Scholl which was recommended by The Council Woman who, through some bizarre twist of fate came to know...anyway, we went to the movie. Chupa and I love the Broadway theater in SLC (2002 Mitt Romney) because we buy Ritter Sports and watch films for intelligent patrons. Like, I saw MI3 in some commercial theater the day it came out and we knew the bad guy was Alskdfjlsk (code name) all along. Cause hello! We did time as an Alias fans, Mr. JJ Unoriginal Abrams. Tom was just Sidney with a short wig and a yguuggyys (code name for new, imaginary and yet fancy technology). I can't recommend Sophie Scholl as a movie to watch on a day where you spent a lot of time and money on new shoes and kitchen bar stools that you will paint Pepsi blue shortly after the purchase. It will make you feel really, really silly. Like mid-way during the movie you look down and see that the wood it took to make your shoes could be heat for some family living in the bush hiding from a dictatorship of the nastiest variety. I spent the rest of the day loathing my easy life. How do I know if I am a hero? Or would be a hero if herodom presented itself? Maybe I need to pick a cause. Have you tried the Choxie Chocolates at Target? Mmmmmmmmm. Good stuff.